Teach Me High School is located in an urban environment. The population is roughly 25% African American, 25% Caucasian, 25% Asian, and 25% Latino. The predominant language spoken on campus is English, however more Hispanic families are immigrating into the school. Teach Me is a charter school and by district policy, its demographic statistics mirror that of the city. By state or charter school policies, students are chosen randomly through a lottery, however to be in the lottery parents need to know the school exists and they need to formally apply. The school has roughly 425 students, about 100 students per class. About 98% of graduating seniors indicate they are going to continue at a community or four year college after graduation. Administratively the school falls in the integrated realm because each department gets to have a say in the technology available to that department. Ultimately, though, all decisions are approved by the principal. Even though there is an Instructional Technologist on staff full time, he still has his purchases approved by the principal before they can be executed. The school moved to the Google platform, much like what Boise State does. They use Google docs to collaborate and communicate, however what happens at in-person meetings is not documented well for those who are unable to attend. The online access to all information is also somewhat convoluted and it can be difficult to find all of the documents or to remember all of the documents and databases that need to be monitored. Attendance is taken online every block. Grades are managed by PowerSchool so students and parents have access to student grades 24/7. Teachers are given deadlines by which they need to update grades so parents and students have a somewhat continuous idea of how well the students are progressing. The school has chosen to not use a Scantron type of system which also means they have chosen to not use a computer database to automatically track multiple choice assessments. Grading is still done by hand and some teachers utilize students to grade multiple choice tests. Since grades are managed by PowerSchool, teachers are forced to adapt to a percentage-based grading system. When teachers have long-term assignments, they will take students to the computer lab daily so students can do research. Seniors have to do a project that requires online research and also requires they make a website, however I am not aware of any formal training the teachers or the students go through to learn how to make the websites. Many teachers incorporate having students figure out things for themselves as a deliberate way of having the students be engaged with the technology. Not all teachers choose to use the computer lab. Many teachers will show PowerPoint presentations via a LCD projector. In 2010, the last year I worked at the school, no classroom had an interactive whiteboard or a clicker system to do any formative assessments. More teachers are having students make websites, however their construction still follows a predominantly linear organization. The dynamic properties of the web do not seem to be integrated into these electronic assignments yet. Given that much of what is done for classroom use or assignments is determined by more than one person, the school is beyond the emergent stage. Since the cycle of feedback is usually limited to a few adults, the school still behaves as islands of expertise. The school falls between integrated and intelligent for the connectivity. The entire school has wireless access to the Internet and email. Staff that need to bypass the filter are given a password so if they want to use a YouTube video in class they can. Specific sites are restricted due to state law or school policies. Being a charter school, there is very little communication with the district. The school has zero dependence on the district for its technology hardware or software so there is very little need to be actively involved with a district WAN. Innovation happens between islands that are somewhat integrated. No staff member deliberately shuns technology, however not everybody chooses to embrace new technology. For example, I wanted to do asynchronous discussions with my students so our IT person made our Moodle shell accessible to my class. He had not been trained on how to use Moodle yet but he did not let that stop him from letting staff members who wanted to figure it out to try it. Sure the Moodle set-up was messy, but we were able to do an asynchronous discussion. If a teacher wants to use technology that is available, they are more than welcome to use it. The bulk of the staff, however, is still in the frame of mind where using the overhead projector counts as technology and using the LCD projector makes it easier to show PowerPoint presentations. The school falls mainly in the integrated realm with a few spikes into intelligent. Compared to other schools I have either worked at or been involved with, they are much further along with embracing technology. I am not so confident about this lesson as I have been with others because I look at other people’s posts in the discussion area and I’m thinking that I missed something in the directions. My listings in my reader are really short. I will have to investigate if that is a consequence of the sites I’ve chosen to subscribe to and forward to my shared reader page or if I am not sharing to my shared page in Google reader correctly. A couple things- I need to know if you can not access the shared page. If you are using your broncomail email address, you should be able to access the page. I created an EDTECH 501 contacts group and put the entire class in it. I am only sharing my shared page with the EDTECH 501 group. I tried to start a reader in my boisestate gmail account but I could not find a link to reader, even under the More tab in the top navigation bar. Even searching the Google apps for Reader was unsuccessful so I’m using Google reader at my normal gmail account. If you see Ntropi, that is because I am ntropi (aka entropy). My husband has made me way too paranoid to make everything I do open to everybody. Until I get a better feel for how reader works, my shared page is going to be private. I wish I could create a share page for each group. If that can be done, please share with me how to do it. I would like to be able to create a share page for each group because it would let me easily create a share page for each class / section I teach. Most 6-12 grade teachers have more than one section of students per day. You may want to do a project with one section, but not another. I would use the RSS links to help guide students toward useful information for the projects. It would let me provide structure as well as help show students which resources can be trusted online. Ideally I could set up a RSS page for each class or project- then again there are so many RSS applets that I bet there is one that will do it and I’m just too ignorant at the moment. I can see myself use RSS like I’ve started using Twitter. I’ll read my Twitter feed to get an idea of what the most talked about topics are- cute little snippets that I can usually click on to get to the article if I want to read it. The RSS feeds are similar in that they are usually a 2 sentence summary (more or less) about the article they are linked to. I would just need to get myself in the habit of checking my RSS feed. I did add the RSS gadget to my iGoogle page so maybe I will check the links more often. I am sure there is an RSS feed app I can put on my iPad. Yep, if I did that, then I’d be sure to become addicted. In the past few weeks I’ve become very fond of getting information quickly to keep up to date without getting stuck in opinion wars or a bunch of “facts” that really don’t have much use to me at the moment. Again, please let me know ASAP if the link does not work. Thank you! I was answering the questions based on what was on the discussion page where we enter our responses. After looking at other people’s entries, I see that either I misunderstood something or I was not paying attention to details or something…. I now have a post at my Learning Log. Thinking about it, I am even more confused because you can’t specify a Google reader shared page to be about a specific topic- what I mean is that I can’t have an educational resources page, a political page, a science page, etc. I have to put all of my shared links on one page. Am I supposed to have multiple Google reader accounts? I am not sure I can even do that because I can’t even figure out how to use Google reader through my Boise State gmail account. I started a Google reader page in my personal Google account a year ago and since it is already in place, I don’t know how to change it to make it specifically about Education or how to make pages directed to specific audiences. If you have a clue- please advise me what to do. I’m not trying to be a slacker. If anything, I’m overwhelmed this week with all that is happening (outside of this class) and I tried to post this early to be ahead of the craziness this week. Do I chalk this up as a “FAIL”? P.S. I’ve started investigating the iPad apps and so far most of them just seem like a way to tap into Google reader. In fact, it seems to be the only reader they want to connect with. I was thinking I could get a reader account at Google and someplace else that organizes RSS feeds (which I have not found yet), but nope, it looks like all of it goes into Google’s reader. If I find differently, I’ll post a reply to this post and let you know what I found. I still can not be logged in to my melissagetz@gmail.com and my melissagetz@u.boisestate.edu email accounts at the same time, but I think if I open them up in different browsers, I can access both email accounts relatively simultaneously. I am still looking into how to make more than one Google Reader shared list and it appears that if I have more than one gmail account, I can do it. It would be one Google Reader shared sheet per gmail account. How many teachers want multiple gmail accounts for every class or subject they teach? I will keep trying out iPad and iPod apps to see if any of them let me classify feeds into particular shared pages. So far all I’ve found are apps that let me import my feeds that are already registered with a Google Reader account. If I find out more, I will come back and post yet another reply to myself to let you know what I’ve found. Although my title may suggest an inability to make concrete decisions, to me it reflects my imagination. While reading/listening to the Horizon Report 2011, I imagined things I currently do or thought about how to expand on activities I’ve done with students. Now what I would like to create is a game that is augmented by being in a biotechnology lab environment, game-based because it involves solving a murder mystery, gesture-based because it involves three dimensional pieces of equipment students can manipulate in a 3 dimensional space, and analytical because the students will do labs that generate data that can be pulled from databases and used to determine whose DNA is at the crime scene. I’ve already done much of this in the classroom, but it was with real lab equipment and I gave them copies of data and made up scenarios for them to calculate genotype frequencies with hypothetical situations. The outreach person at CEPRAP, Barbara Emberson, created an augmented game several years ago that I’ve used with students. Image from the DNA fingerprinting software game. http://ceprap.ucdavis.edu/index.php?option=com_content&view=article&id=71&Itemid=137 I used it to introduce students to the idea of what we’d be doing in the lab before we did it. It helped some students understand what we were doing with the micropipettors and why we were doing the labs we were doing, however in some ways because it was completely virtual with students not actually using equipment, it was somewhat a waste of class time. If given a choice between having students do a virtual lab and having them do a real lab where they are working with real lab equipment, my vote is for the real lab. Not every school can afford the real biotechnology equipment and now that science education companies are getting into the biotech scene, much of what is made is a bunch of junk. It would be more economical for a company to design a micropipettor that can be hooked up to a computer system so the user can get immediate feedback on their technique. They’d have to dial the numbers correctly to micropipette the correct amounts of liquids, run the gels, stain them, photograph them, and gather their results with the three dimensional and computer equipment. Although I was not able to use the software with my students, computers now map the location of bands and do all of the calculations necessary for the sizes that are in each lane. Although I used the electrophoresis method to teach students how to draw a graph using a linear regression curve, I don’t know that they have to know how to do that by hand anymore. One of my former students who is now getting a PhD in microbiology laughs at me when I talk about the sequencing gels I ran when I was in grad school. She does not do any of her own sequencing. She sends her sample to a sequencing service on campus and several hours later she gets her results. We can simulate this for high school students by using the various technologies mentioned in the horizon report. 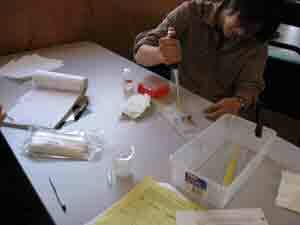 Below is an image of student working with a micropipetter. 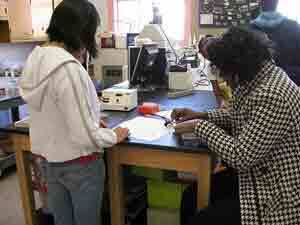 In this picture you can also see the carbonless copy lab notebooks we used. Electronic books- Imagine lab manuals that can call off the instructions to the student and they automatically get checked off as the student physically does that step in the protocol. I don’t know if I want lab notebooks to be virtual, but my student also informs me that the carbonless notebooks that I have students use in the biotech class are now being replaced by typing in results in the computer. I can only imagine equipment becoming sophisticated enough that it automatically logs into a data sheet what the human did during the lab. In my simulated biotechnology lab game, if the student micropipettes 42.6 uL of liquid, then it could automatically be written into an electronic lab notebook. Augmented reality- the student could view their manual actions taking place in a virtual biotechnology lab. Their gestures get recorded as they use plastic equipment that mimics real laboratory equipment. 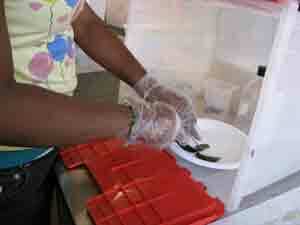 The difference is that the student will virtually make a gel and pour it. They wear gloves in the lab anyway, so why not have them wear gloves that keep track of where they are moving their hands. They can make the agarose, heat it up, let it cool down, and pour it. We’d write the game so that if they poured it too soon, the gel would be brittle and have lots of unnecessary bubbles. Imagine being able to measure the gestures so well that in the virtual lab, students would have to demonstrate the same techniques they’d have to really do in the lab. Game-based- to make the lab game based, all we have to do is immerse it in a context. Frank Stephenson wrote much of the BABEC lab stories that when I had the time to embed the labs in a story, I did. Link to BABEC curriculum:http://www.babec.org/node/6 BioRad has also submerged many of their labs in a context. For example, I used to use the BioRad primers to test foods for evidence of genetically modified organisms (GMO) with my students. Link to BioRad GMO investigator kit: http://www.bio-rad.com/prd/en/US/adirect/biorad?ts=1&cmd=BRCatgProductDetail&vertical=LSE&catID=1128f1a0-662c-4450-ad12-1b3634f4f18b Although BABEC also provided primers, I liked the BioRad ones because they made the purpose of the primers much more obvious. Imagine doing a lab like the GMO lab with classrooms all over the US instead of just with the few samples done with my students. This particular lab does not have to be a virtual one; I’m just brainstorming about how I could have expanded the GMO lab to include data that went beyond our local grocery store and our few results. All it would take is a little imagination to turn the GMO-PCR lab into one that either stayed hands-on with real equipment and foods, or became virtual where our samples being tested were already ones sitting in a database. If done hands-on, then I would love to see the lab expanded to a global context. The could even collect data outside the US as genetically modified foods become more global. Gesture- based- If we turned the biotech labs into virtual settings with “real” equipment analogous to the models used in Wii games, then we could have gestured-based learning. With this type of biotech equipment, there would be nothing to wash at the end of the period. I would not have to have multiple sets of equipment that would have to stay “in use” by one section while another section did a multi-day lab. The $200 micropipettor would hopefully be replaced by a less expensive plastic one that was connected to a computer so its physical use could be monitored. Imagine being able to have eight sets of lab equipment for what it used to cost to have one or two sets. 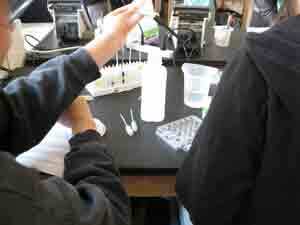 Students collaborating in a high school biotechnology lab class. Learning Analytics- one thing I detest about most of what is available for high school students in the biotech classroom is imaginary lab settings that can not be directly connected to what is done in a real forensic or research lab. For example, I even had a graduate student come in and want to do a simulated crime scene lab with me where the students used restriction enzymes to discern the human DNA found at a imaginary crime scene. While restriction enzymes (RE) have their purpose in the lab, mainly for cloning pieces of DNA into a vector, they have not been used for human identification for years. You need too much DNA to do a RE digest. The grad student seemed so offended that I shot down his idea of wasting my students’ time by doing a lab that had no basis in reality anymore. I was appalled that he had the nerve to suggest I waste time doing something with my kids that was antiquated and now a part of the history of forensic science instead of being a current trend. When you watch a tv show that suggests using RFLP analysis, you know the show is dated because that is now a waste of time, money, and human energy. Plus, it requires too much DNA for it to be practical. Using the Polymerase Chain Reaction (PCR) is now done to categorize DNA and its patterns. Last year I tried to create a scenario where my students used genotype frequency data to determine the likelihood someone’s DNA occurs in the population. I was basing the data on a list of specific allele frequencies that have been identified in a population. Finding this data was not easy, nor was it easy to show my students how to use it. Link to article with data I used with the class: http://www.melissagetz.com/biotech0910/handouts/Allele_Frequencies_for_26miniSTRs.pdf Two of my students demonstrated how ineffective the exercise was when for their final project they decided to use data that resembled what one gets by doing RE digests of DNA. I was furious when I saw that this is how they wasted their time and ours, but unfortunately since it was the end of the year I did not get to express to the class how what we just did was completely inaccurate and demonstrated how not to use DNA to find answers to questions. Now if I had access to a database where students could have used software to easily do the math that shows how multiple allele frequencies need to be used to show the rarity of a specific genotype, then I would have been less likely to have students who chose the easy way out for their assignment. Since the entire class would have been able to follow the math involved with the allele and genotypes easier by having a computer program that let them play with the numbers, the entire class would have seen the students’ final project was a bunch of junk and it would not have had to fall on the teacher to be the only one who understood what was going on. I would like there to be an online database of allele frequency data so that biology and/or biotechnology teachers could use the data and have students calculate or figure out whose DNA was found at a crime scene. Is that too much to ask for?